The Gujarat-wide campaign attracted considerable attention, so much so that it was called an effort by a “green gang” to fight for women’s rights. In one such campaign, a media report said, 1,600 “bravehearts” from various villages of the state joined a rally with green muffler tied around the forehead on the first day of the rally. The media report said, “These women have done incredible work in the field of human rights. They would talk about the issues and challenges pertaining to women.” The motto of the campaign was – Dalit women suffered two types of oppression, one as a Dalit, and another as a woman. 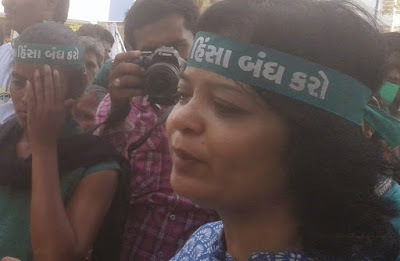 In fact, pointing towards how an male employee behaves, she regretted, instead of apologising, this male employee "tried to do everything by filing a case in the labour court, lodging a police complaint, by trying to lodge a petition in the High Court of Gujarat”, adding, this employee went so far as to “a letter to the charity commissioner." Recalling what it means for a woman to be in the leading position, Pradeep said, “Eleven years back, I was elected against five Dalit men who were my colleagues, to lead Navsarjan. From the first day itself, I started tasting the bitter truth of what it means to be head. Those men who lost against me, tried to make my life hell”, Pradeep says. “They tried to implicate me in a false murder case. There were several of them who sat with banners, placards, stripping themselves saying, I am the worst ever person in Dalit movement. They equated me with Hitler. They humiliated me by saying that I am a loose character woman”, she angrily said.